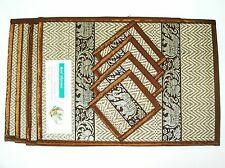 Beautiful authentic Thai placemats and coasters. Set of 6. Reed and silk materials. Olive green color. Elephant design. New in plastic packaging. Pineapple Placemats. tropical flair unless Tommy Bahama is your ALWAYS style-- these are a MUST HAVE! Tommy Bahama. no stains etc-- in EUC. Edged in a soft Teal popping with vibrant yellow pineapples. You'll add a refreshing new look, protect table or counter surface. Makes an exciting gift! for years of durability. Heat resistant to 225 degrees-F..
RED COLOR HANDCRAFT ELEPHANT REED. 4 PLACE MATS & COASTERS DINNER. 1 SET = 4 pcs. of placemats 4 pcs. of drink coasters. MATERIAL : REED, SILK. Wipe with dry cloth, Do not soak in water . if wet, dry under direct sunlight. ELEPHANT REED. 4 PLACEMATS & COASTERS DINNER. 1 SET = 4 pcs. of placemats 4 pcs. of drink coasters. MATERIAL : REED, SILK. Wipe with dry cloth, Do not soak in water . if wet, dry under direct sunlight. ELEPHANT REED. 4 PLACEMATS & COASTERS DINNER. 1 SET = 4 pcs. 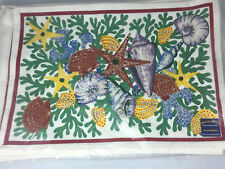 of place mats 4 pcs. of drink coasters. MATERIAL: REED, SILK. Care Information : Wipe with dry cloth, Do not soak in water . if wet, dry under direct sunlight. 4 PLACEMATS & COASTERS DINNER. BROWN COLOR HANDCRAFT ELEPHANT REED. 1 SET = 4 pcs. 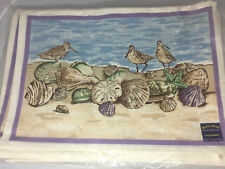 of place mats 4 pcs. of drink coasters. MATERIAL : REED, SILK. Wipe with dry cloth, Do not soak in water . RED COLOR HANDCRAFT ELEPHANT REED. NEW 6 PLACE-MATS & COASTERS DINNER. QUANTITY : 1 SET = 6 pcs. of placemats 6 pcs. of drink coasters. Wipe with dry cloth, Do not soak in water, if wet, dry under direct sunlight. 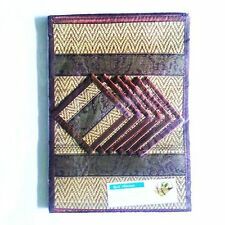 Decorated with elephants which are signature animal of Thailand, made by Thai silk and natural reeds ,our product are produced by Thai skilled craftsman, The design is the authentic Thai design which make our product outstanding from others.